"...assisted in 130 suicides and was released from prison in 2007, after serving eight years. [...] no one disputes that Jack Kevorkian prompted debate. Today, doctor-assisted suicide is legal in three American states. 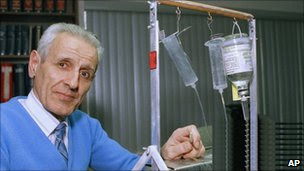 [...] Kevorkian first gained international attention in 1990, helping a 54-year-old Alzheimers patient to die. Many assisted suicides were conducted using his so-called mercy machine, which delivered lethal amounts of drugs intravenously." It's a total tragedy that people can become so aged or unhealthy or severely pained that physician-assisted death is their final choice, but I'm a firm believer in the absolute individual right to make such a decision. But those advocating this modern, rational stance face an evil inquisition from the forces of religiosity and stupidity. Read here, courtesy the Friendly Athiest, Kevorkian in his own words sharing his humanist credo.